Heiwa wrote: Driving a scooter for many years I know that the accelerator handle is on the right on the steering bar, so unless the gunman was a leftie, his right hand must have left the handle and then grabbed the gun (in a pocket?) starting the killing and then put the gun back in the pocket to be able to speed off ... assuming he was sitting on the scooter all the time supported by one or two feet on the ground with scooter between legs. If he stepped off the scooter, he had to park it someway using one of the two supports and you really need two hands then to push the scooter on the support. So it is not so easy just to drive up on a scooter and open fire. "All three attacks were carried out by a man on a powerful motorcycle who was wearing a helmet and carrying a Colt 45, Prosecutor Francois Molins told reporters in Paris. But he said other clues to the killer's identify were scarce." "All seven victims of a shooter spreading terror in southwest France were killed with bullets to the head, shot at such close range that the gunfire burned the skin, a prosecutor said Tuesday." Seems like they're introducing the main antagonist somewhat similar to ABB: limited, extremely low quality imagery, then slowly diffuse "better" and "better" material. Simple business tactics, really: at first, loud commotion, some "possible" names/figures thrown in the air, a tiny bait in the form of crude initial (=beta? ) imagery, then slowly trickle more "substantial" "information", images, etc. The rest then almost takes care of itself, once the show machine has been put into motion. These deceptions seem kind of depressingly simple - yet they are efficient, from a mechanical large-scale 'production-reception' point of view, that is. So the show is over. After having taken cover in the bathroom of a small, ground floor flat, at Toulouse and having been surrounded almost 48 hrs by 50 anti-terrorist RAID soldiers, giving interviews via his portable telephone, there was a 10 minutes fire exchange between the lonly, alleged killer Mohamed Mereh and the RAID soldiers this morning. Nobody was killed and, we are told, Mohamed Mereh, still alive, tried to get away via the window of the bathroom facing the yard. Then, in the yard, he was shot by a RAID soldier. Imagine that ... he tried to escape ... via a bathroom window! I've been having a bit of a giggle, (partly in disbelief,) at this pic. Quote: Suspects: One of these three soldiers posing with a Nazi flag could be the man responsible for a series of shootings in the Toulouse area of France. Wikipedia wrote: The three wise monkeys (Japanese: 三猿, san'en or sanzaru, or 三匹の猿, sanbiki no saru, literally "three monkeys"), sometimes called the three mystic apes, are a pictorial maxim. Together they embody the proverbial principle to "see no evil, hear no evil, speak no evil". The three monkeys are Mizaru, covering his eyes, who sees no evil; Kikazaru, covering his ears, who hears no evil; and Iwazaru, covering his mouth, who speaks no evil. Capturing what is purported to be bodies on thier way to burial. This first one is supposed to be an eight year old girl . 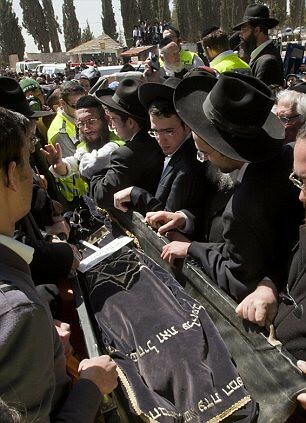 "The body of eight-year-old Myriam Monsonego, the daughter of the Toulouse headmaster, Rabbi Yaacov Monsonego, is lifted and carried from the funeral service in a Jerusalem cemetery to her grave, 21 March 2012, as she and the three members of the Sandler family are buried in the same service. The bodies of the four victims of a shooting attack at a Jewish school in the French city of Toulouse on 19 March were laid to rest in Jerusalem." 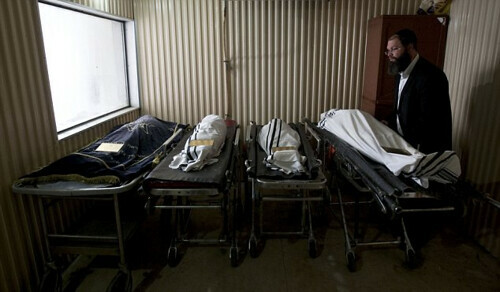 "Heartwrenching: An Israeli Zaka volunteer stands next to the bodies of Monday's shootings in a morgue before their funeral in Jerusalem today. Rabbi Jonathan Sandler, his sons Arieh, 5, and Gabriel, 4, and seven-year-old Miriam Monsonego were gunned down." “The killer came out from the bathroom shooting very violently. The bursts of gunfire were frequent and hard,” Gueant said. “A RAID officer who is used to this kind of thing told me that he had never seen such a violent assault. I mean...WHO writes this stuff? Why didn't they script more media stories with the main antagonist sim still "alive", I wonder? Such a quick "deletion"! - the endgame incident "took place within a few minutes journey from a key French army barracks which greatly assisted in controlling access to the scene of the stand-off, and in providing logistics support to the anti-terrorist police". - the alleged terrorist was detected following him having contacted a garage asking "to have his powerful black scooter repainted". Seriously?? - the alleged terrorist was detected at least in part due to him having contacted a Yamaha dealer "to gain advice as to how he could disconnect the GPS tracker on his scooter" (a scooter which was also reported in news reports as being stolen in the first place). A megabucks BMW touring bike might have an anti-theft tracker fitted- I've never heard of this being fitted on a scooter. - following the first shootings, the scooter shooter was "filmed by more than 40 CCTV cameras but was then lost when he joined motorway traffic"...in Europe, most scooters are forbidden from using motorways. (I'm reminded for some reasons of the movie/book 'Day of the Jackal'..not just the French connection (no pun), but perhaps also the large numbers of motorcycles in the movie). Later radio reports stated that "he came through the window firing wildly" (cowboy/Ned Kelly motif). UK television reporters tonight are confidently asserting that "he died the way he always wanted to go", as if he were some B-list celebrity that they've all got some level of collective empathic awareness about. Another unrealtic piece of reporting was the insistence today that "they'd heard nothing from him overnight, and anything could have happened to him", yet evening BBC/ITV news was claiming the use of fibre-optic cameras and microphones throughout the house. As well as meticulously-accurate(?) wirebox blueprint graphics layouts of the house interior...fresher than a CRS commander's tactics wallchart. This all just looks incredibly unrealistic, implausible, impossible, so, why so poorly generated? French/Euro default disfunctionality. Difficulties in emulating the North American slick production values?? Last edited by reel.deal on Mon Oct 01, 2012 10:21 am, edited 1 time in total. 1. Monday: Soldier allegedly sells motor bike and allegedly gets killed by bad gunman! No witnesses! 2. Tuesday: Three soldiers at money machine allegedly get shot by bad gunman on black motorbike and two are killed/one injured. No real witnesses! 3. Wednesday: Four Israeli citizens, a man and three children, are allegedly killed in rampage by lone, bad, crazy gunman on white motorbike early Wednesday morning at virtually empty, Jewish (!) schoolyard (1 hour before Jewish school opens - if it opens on a Wednesday?). Corpses are quickly shipped away to Israel. Witnesses?? 4. Thursday: Alleged gunman (now identified as a muslim) is held-up in mother's ground floor flat for 36 hrs by 200 RAID (SWAT) soldiers with plenty onlookers. We are told objective is to catch bad, crazy, full of hate gunman alive. Bombs go off in the night. In gun battle Thursday morning gunman is killed in the street with 20 bullets in his body while getting out of bathroom windows into yard/street behind flat - two that killed him: one in head (by sniper! ), one in stomach (by some other hero). Alleged gunman, Mohammed M, 23 years old, we are told is not really French as grandparents came from Algeria 50 years ago. He finished school at 16 and has since done nothing except some minor crimes + two trips to Afghanistan/Pakistan + and is known to social authorities as a misfit. He has a brother (a good muslim), two sisters and a mother (father not around), we are told. And a sister-in-law that carries a veil = good muslim. What a stupid script. Who wrote it?